Rush Limbaugh surrendered to the Palm Beach County Sheriff's Office in April 2006 after being charged with doctor shopping. According to investigators, the 55-year-old Limbaugh bounced from doctors in a bid to secure multiple prescriptions for powerful painkillers like OxyContin. 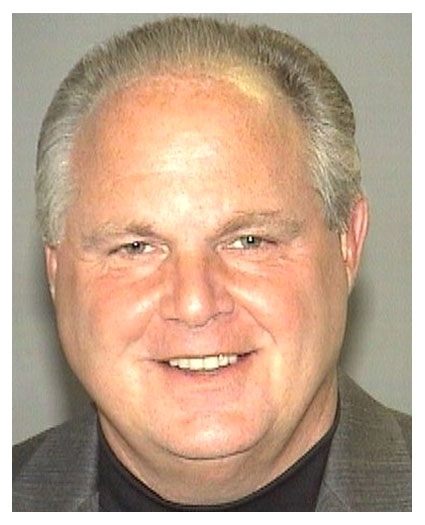 In a settlement with Florida prosecutors, the felony case against the conservative radio star will be dropped in 18 months if Limbaugh continues to undergo addiction counseling and is not arrested again. He also agreed to pay about $30,000 in fines and court costs. Submitted by parlayer on Tue, 2011-06-14 23:08. Rush America Hero, and Anchor Man. on his show "a spade is a spade" no spin, discount at your own pearl. Submitted by MrJay214 on Wed, 2011-04-13 14:19. Rush called for all people busted for "hard" drugs to get the max sentence. Would opium based prescriptions qualify you hypocritical jack-a** you? Shame on those who follow this neo-con propaganda pushing liar! And 4 the record, I am no liberal by any means. Submitted by parlayer on Tue, 2011-06-14 23:00.
can't handle it, can you. lol, lol, good for Rush. Submitted by clairpie on Tue, 2011-03-15 15:15. What a waste of space. This piece of **** makes me sick. Submitted by parlayer on Tue, 2011-06-14 23:01. ++++hook you make me sick with your hate. Submitted by NoDuh on Tue, 2011-03-01 13:50. This is the guy who said ALL drug USERS should get life in prison! and he still accepted this sentence!! Submitted by parlayer on Tue, 2011-06-14 23:02.
scripts ain't illeagel smack is, get a grip, or slipoff. or something off. Submitted by MagnumXL on Fri, 2011-02-18 14:43. Submitted by parlayer on Tue, 2011-06-14 23:03.
and what does the color black look like, snow?? Submitted by nIT2winIT on Sun, 2011-01-02 02:28. Submitted by nastynorm on Wed, 2010-12-22 00:47. Submitted by parlayer on Tue, 2011-06-14 23:04. Wind bag?? pretty good for a windbag. i bet that hurt him. he might even quit after all that. Submitted by JD on Fri, 2010-09-24 01:54. Grateful recovering dittos el Rushbo!!! At least this guy took responsibility for his addiction. Submitted by The_CoolerKing on Sat, 2011-03-19 12:55. Actually he used lawyers to block investigators on his drug case and blamed his addiction on his doctors and back injury. So no, he didn't take responsibility. Submitted by parlayer on Tue, 2011-06-14 23:05.
same as i would do. thats the law. they made the rules. Submitted by xMacbethx on Mon, 2011-04-04 20:15. Well those investigators are idiots if they were blocked, because he admitted the whole story - details and all - on air, before he even turned himself in. Also, seeing as you must be someone who has never had any sort of serious pain - you take pain pills for pain, and if you take them too long - even if you are still in pain, you become addicted. It's quite a common occurrence. Which is why he also blamed his doctors who knowingly gave drugs to an addict, any decent doctor could have found out that he would have been at least nearing addiction levels based on amount given & time taken. There is a difference between acknowledging responsibility for where you were wrong, and not being stupid and piling more legal problems than rightly deserved according to the law on yourself. Any liberal with a half decent lawyer would have done the same exact thing. Submitted by Par4thecourse on Tue, 2010-08-03 12:40. Submitted by parlayer on Tue, 2011-06-14 23:07.